It is 2014, and we should all be in therapy. At least, that's according to Isaac Asimov, one of the 20th Century's best-known science fiction authors, who in 1964 published an essay predicting what our world would look like today. 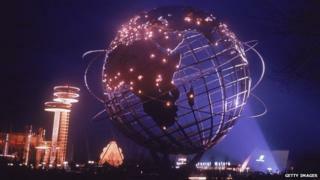 Not a mental breakdown - despite his insistence on the importance of psychiatry in the future - but rather the World's Fair in Queens, New York, which opened 50 years ago today. Although the official theme of the fair, which ran for two six-month sessions, was Peace Through Understanding, today it is primarily remembered for its vision of the future. And while some of those futuristic technologies on display never quite went mainstream - underwater housing and levitating cars, anyone? - a closer look at Asimov's World's Fair of 2014 reveals that his crystal ball was shockingly clear. Here's a look at 2014, through the eyes of 1964. 1. "Communications will become sight-sound and you will see as well as hear the person you telephone." The first transcontinental video call between two places was made on 20 April 1964 using technology developed by Bell Systems (later Bell Laboratories), which may have partly inspired Asimov's prediction. However, he would certainly be surprised at the low cost of products such as Skype and Apple's FaceTime: in 1964, a three-minute video phone call from Washington DC to New York cost $16 (£9) - around $118 in today's money. 2. It will be possible "for you to direct-dial any spot on earth, including the weather stations in Antarctica". Just dial country code 672 (for some parts - others use New Zealand's country code, +64). 3. "Robots will neither be common nor very good in 2014, but they will be in existence." Asimov is credited with introducing the word robotics into the English language, so it is perhaps no surprise he was right in predicting that no real robot yet exits that can rival The Jetson's housemaid, Rosie - first brought to screen in 1962. But there are projects under way to get robots to pass Japan's university exam, perform remote surgery, and even cook a gourmet meal. Asimov also came close to identifying what has become a crucial component of modern life: "miniaturised computers", also known as smartphones, which he thought would serve as the "brains" of robots (anyone who has tried to navigate a foreign city without the use of a smartphone map might wonder if he really meant brains of "humans"). 4. "As for television, wall screens will have replaced the ordinary set; but transparent cubes will be making their appearance in which three-dimensional viewing will be possible." One of the most notable aspects of Asimov's predictions is that he often nailed the technology, but overestimated the enthusiasm with which such technologies would be greeted. To give him his due, flat-screen televisions have replaced traditional sets, and 3D television technologies, while not in cube form, have long been a highlight of the electronics trade show circuit. But audiences have generally shrugged: the BBC said in July it would suspend its 3D programming due to a "lack of public appetite". 5. "Conversations with the Moon will be a trifle uncomfortable." Of course, Asimov was bound to have a few duds. The dawn of the Space Age might have made him a bit optimistic about communications with our Moon suburbs - calls would have a delay of 2.5 seconds, he thought - although he was spot on when he predicted that by 2014 "only unmanned ships will have landed on Mars". He did not, however, predict the Mars Curiosity's Twitter account. 6. "Kitchen units will be devised that will prepare 'automeals', heating water and converting it to coffee." Automated coffee machines do indeed exist. Asimov's predictions that processed yeast and algae products would be available in a variety of flavours, including "mock-turkey" and "pseudo-steak", were semi-realised last year when scientists unveiled the first laboratory-grown burger. Critics might be divided on whether or not Mr Asimov was right about the taste being "not bad at all": some who ate the burger said they "missed the fat". 7. "An experimental fusion-power plant or two will already exist." The joke goes that fusion - essentially, harnessing the power inside stars - is the power of the future, and always will be. And that continues to be the reality, although there is a $22bn multinational effort under way to get a reactor up and running by 2028 in the south of France. But Asimov's predictions about large solar-power stations in desert and semi-desert areas like Arizona and the Negev desert are accurate. Power stations in space, "collecting sunlight by means of huge parabolic focusing devices and radiating energy down to earth" remains an out-there goal. 8. "Much effort will be put into the designing of vehicles with 'robot-brains.'" "Robot-brain" surely has a better ring than "self-driving car". Asimov's other transport predictions - while just as catchy - still remain the stuff of dreams. The aquafoils, which "skimmed over the water with a minimum of friction" and impressed World's Fair visitors in 1964, haven't caught on. Neither have their successors - jet packs and hovercraft. 9. "Not all the world's population will enjoy the gadgetry world of the future to the full. A larger portion than today will be deprived and although they may be better off, materially, than today, they will be further behind." Asimov predicted more - and got more right, or semi-right - than is possible to list here. His fears about population growth and birth control could be the stuff of an entirely separate article. But perhaps his most prescient observation, or warning, was that while technology, both then and now, has the power to transform lives, without efforts towards equal access, it can hurt, rather than help, the goal of "peace through understanding".